KLAW supplies a range of couplings suitable for Ship-to-Shore bulk transfers of liquids, gases and other transferable media. KLAW cryogenic and hazardous chemical couplings are specifically designed to cope with the coldest and most corrosive of media transfers. KLAW couplings offer 30% higher flow rate over leading competitors; with lower pressure drop rates across the KLAW range. The KLAW design means that units are more compact and lightweight; therefore making them more versatile for the demanding pressures of Ship-to-Shore transfers. With the majority of ship loading and unloading being completed at a shore location, the task has the potential to create a large volume of potential accidents. Utilizing a KLAW Coupling within the transfer system can significantly reduce these risks. 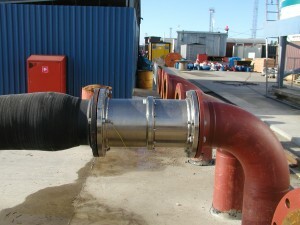 A KLAW coupling therefore offers valuable protection to equipment and dock staff. Both KLAW Breakaway Couplings and Emergency Release Couplings are available for Ship-To-Shore transfer applications. Sizes available up to 12”.